Wow... bin begeistert. Apollo twin und UAD Marshall 2203! Ohne lange zu probieren bekomme ich den Ton, den ich von einem guten plug-in erwarte! Thanks softube und UAD!! Another amp in the studio. As all the other Marshalls you want this one. If you use (of course you do:-)) an Apollo interface with the Hi/Z input and this amp in the Unison slot you can be stucked for hours just playing because of it is like playing the real thing. I always , record with wet sound into DAW as in areal studio with a real hardware amp, you set the sound that suits the track and plays, this happens with the Unison Marshalls you becomes a musician, which is way we all starts in the beginning. Buy this plug and an Apollo interface. I am still learning to dial it in, and I don't actually know whether it sounds just like the original or not. I am happy with the sound it puts out, although I still need to learn how to dial it in. That being said, it takes a HUGE amount of the DSP. I pretty much can't use it on my Twin unless I am happy having nothing else in the chain. If I want to use this, I need to use it on my QUAD. Sorry but not sold on this one UA! Downloaded the demo. To me the silver Jubilee was is a smash hit but the jmp 2203 left me scratching my head. First off some of the stock adjustment sounds were either to flat and bassy or way to brittle and high endy and some of these tones left my ears ringing at low volumes. Not sure why. On the other hand I did manage to dial in so alright tones by messing with the mics and knob settings. The filter cut is pretty cool and you will need it especially if you decide to use some of the stock tones. If guitars sounded this bad in the 80's I am lost for words. Well hopefully UA will model a mesa of some sort in the future. I really dont think they will be able to top the Jubilee. I was generous with 3 stars. stumbled on the new Marshall 2203 plugin, and since I already have the other Marshall plugins it was an easy decision to buy it. So, downloaded and plugged in my '79 Custom and lo and behold - its a really insane plugin which nails the 2203 sound and also is a great tool for experimenting with settings (incl all 10's) and mic combinations. I own an original 2203 from 1978 which I bought new in London and have played ever since, in my case through a late 70's 1960A with Celestion G12-65's, and copying my settings gives me a very accurate tone and response from the plugin. In my experience the G12-65 is a bit more "open" than the G12-75, which is also emulated accurately. After only 30 minutes I am absolutely sold on this one! ....I’ve used. Great realistic tones. 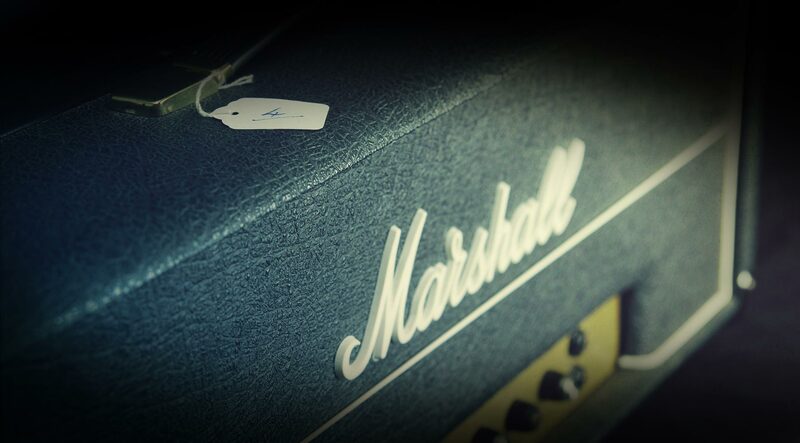 Can't have a Marshall stack in your house? No problem! Download this plug in and you'll feel like you have it anyway! I grew up with the real thing in my Bedroom! I cannot believe that this plugin captures every nuance of the real amp! My Favorite amp emu from UA!!! I have all the marshalls, the Friedmans, Fender and the chandler. A must have amp, probably the most versatile of all the amp sim that I’ve tried! I love the diversity of mic settings, you can tweak the sound for amazing results. Amazing amp sim...i've bought all marshalls, every amp has a unique tone, loving it. It's very convenient to use. There are indeed some Marshall JMP 2203 timbres. Sound quality is different from the real one. Maybe it's impossible to simulate reality. I have used most amp plugins out there last 15 years. This is the closest i have ever come to my real Marshall amp. Kudos to you Softube!!! Très bonne émulation du fameux 2203, par contre je préfère utiliser l'orignal car je peux placer mes micros comme je le souhaite. Mais cette version est vraiment fidèle à l'original. I initially bought the Plexi and was very happy, so then completed the Marshall bundle following the evolution of guitar rock sound. Great amps, all of them! Love this plug-in. I fire it up and play it for ten minutes and then realise I'v been playing for over a hour. Great ! The Marshall JMP 2203 plugin from UA is sweet. I waited for a sale and grabbed it. I can’t say I’m an experienced user of the original 2203, however when I use the plugin it sounds awesome. It’s too easy to get a nice sound. I like putting the Tube Screamer plugin on the channel but not on... it seems to make a slight difference to the benefit to my ears. Solid amp plugin.